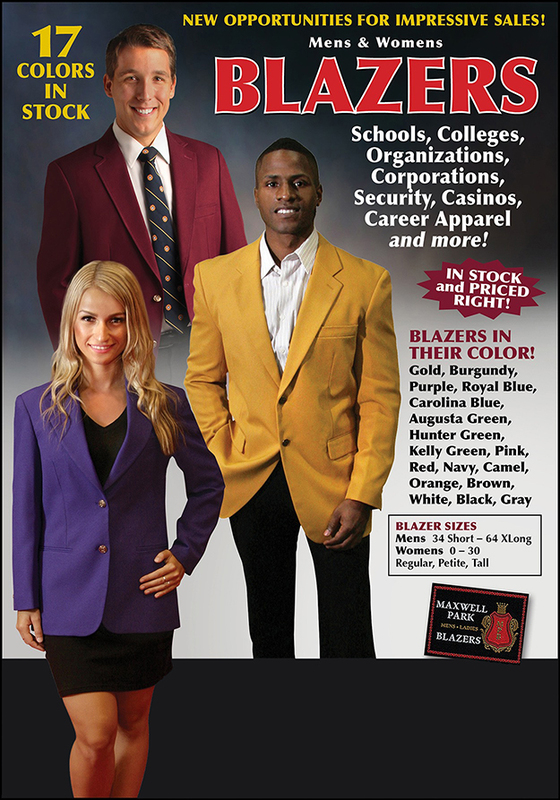 Blazers-R-Us prides itself on having the largest selection of colors of wholesale blazers for the embroidery trade. Below is shown a free downloadable .pdf ready made poster - flyer made especially for embroiderers and ASI distributors that you can print and show your customers showing them how nicely they'd look in a custom embroidered blazer. This page can be used "as is" or you can add your stores name, address, phone #. Your choice. In terms of marketing, while it is true that everyone loves a new customer, your best or most likely source of business may be your existing customers. They've already seen your work and have a relationship with you. And you already have their digitized logo in house. Perhaps all they need is a sample blazer with their logo on it to sell them on the idea. Best of all, by purchasing the blazers wholesale, you profit both on the embroidery and on the blazer itself!